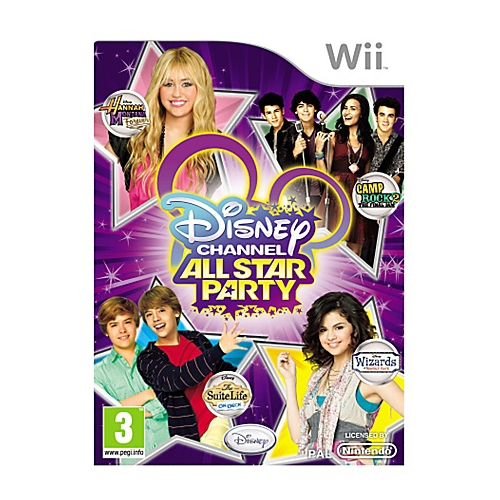 Get the party started with Disney Channel All Star Party on Wii! Play as Disney Channel favorites from Sonny with a Chance, Hannah, Jonas L.A. and more! Jump into the party and import your Mii. Compete to be the ultimate All Star in over 30 hilariously fun games! Check out Disney Channel show locations from Phineas & Ferb, Wizards of Waverly Place, The Suite Life of Zack and Cody and more! 7 Disney Channel shows included in the game! Sonny with a Chance, Hannah, Phineas & Ferb, Wizards of Waverly Place, The Suite Life of Zack and Cody and Jonas L.A.